A new spirit infuses a once-neglected Louisville neighborhood about five miles from Churchill Downs, home to the annual Kentucky Derby, this year on May 5. The New Louisville district (NuLu for short) is a five-block stretch of East Market Street, just past the Interstate 65 Overpass. Lined with eclectic Victorian-era buildings, the upbeat district is buzzing lately with cool eateries, shops and thriving local businesses. Two new additions are bolstering NuLu’s renaissance, just in time for Derby season. With its launch on May 5, Rabbit Hole Distilling, the latest in Louisville’s urban distillery revival, joins dozens of establishments along the city’s Urban Bourbon Trail bar and restaurant circuit, and the 152-room AC Hotel by Marriott is set to open May 2. ZeroBuses — free, all-electric public transit buses — and LouVelo shareable bikes connect the lively zone to Louisville’s downtown core less than two miles away. 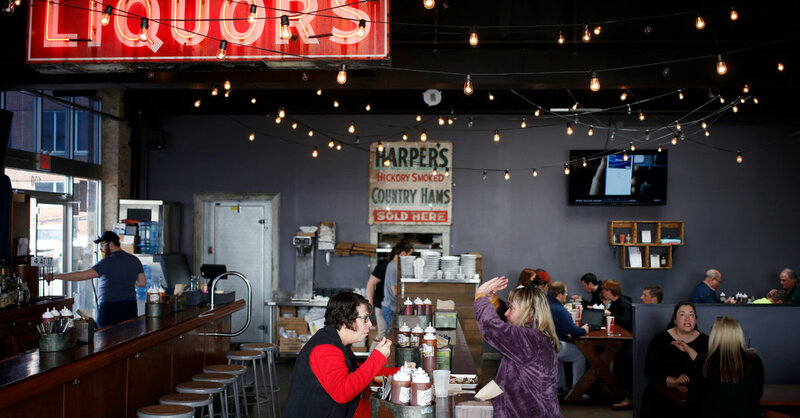 On weekdays, this former truck repair shop serves as a meeting place for local entrepreneurs and construction workers who gather around picnic tables to nosh on hearty Southern comfort food elevated by locally sourced ingredients. Offerings at the three-year-old hot spot include juicy pulled pork cakes, creamy hand-cut slaw, tater tots and spicy collard greens drizzled with sweet Kentucky sorghum. On weekends, the quick service joint draws a long line of fans from across the city, thirsty for a Country Boy Brewing Cougar Bait ale, one of many local brews on tap, or a bourbon slushy. Logan Manford, a former construction worker, opened this two-year-old shop on a shoestring with the purpose of designing and selling the kind of understated, gender-neutral comfort clothing his Louisville friends craved but couldn’t find. Ten percent of sales go to charities. Sales took off in November 2016 when the multiplatinum singer Demi Lovato wore one of the shop’s soft T-shirts in her Snapchat story; other made-in-the-U.S.A. items include hoodies, tanks, crop tops and sweatpants. This groovy fusion food spot is on the ground floor of The Green Building, a LEED-certified, repurposed 19th-century dry goods store whose tenants include architects, an art gallery and a hot chicken joint. It’s a fine stop for a sweet potato and egg “wakataka” taco or tahini sambal and cucumber labna dip on house-made flatbread, washed down with a spicy margarita featuring grapefruit simple syrup and freshly sliced jalapeños. The local D.J. Sam Sneed and others spin hip-hop and electronica sets Thursday to Saturday nights. Since 1921, loyal customers have sated their sweet tooth at this family-owned candy store. Favorites are bourbon balls — hand-dipped chocolate confections infused with 100 proof Barton’s bourbon, and marshmallow modjeskas — caramel and chocolate-covered sweets named after a popular Polish actress of the Victorian age, Madame Helena Modjeska. The confections are made from original recipes and served by cashiers in hairnets who often address customers by name.